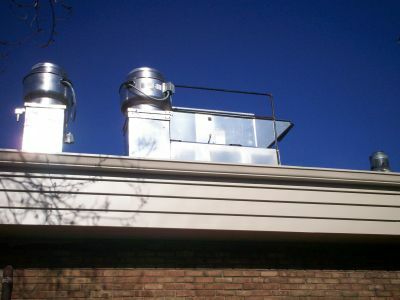 St. Peter and Paul Church was in need of a make-up air system for their kitchen hood. They selected an AbsolutAire V-Series 100% outside air direct-fired unit because of its simple controls, exceptional value, and short production time. The unit was provided with an exhaust fan motor starter so that the two systems could work together. To keep installation costs down, a flat common curb was provided to support both the V-Series and the exhaust fan on the roof.